Read any car engineering book or website and you’ll find plenty on handling – but very little on ride quality. That’s largely because over the last few decades car manufacturers - and modifiers – have concentrated on handling at the expense of ride quality. That’s a very generalised statement but it holds true for most cars: go for a drive in an older car – especially a Citroen or one of the Hydrolastic-suspended British products – and the ride quality of those machines is clearly superior to the vast majority of current cars. But why care about ride quality? The easiest way to answer that is to say this: ride quality impacts the user of the vehicle every single moment they’re in the moving car. On the other hand, handling prowess is relevant for only a tiny proportion of the time. That’s not to say that handling isn’t very important, but with legal driving restrictions and strict policing, it’s perhaps a fair amount less important for a road car than many people believe. Finally, if you’re into the development of ultra lightweight vehicles – whether they’re driven by an electric motor, small combustion engine or even human power – then achieving good ride quality becomes both difficult to achieve, and more important. Difficult, because of the short wheelbase and small wheels, and more important, because if the occupant is comfortable, the other compromises present in such a vehicle are much more likely to be embraced. What really changed my understanding of quantifying ride quality was a brilliant engineering paper written by Dr A Moulton and A Best, both of Moulton Developments. 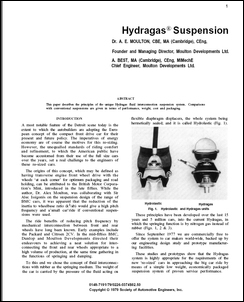 The paper, SAE 790374, was published in 1979 and presented the Hydragas suspension system to a US audience. Hydragas, developed by Moulton following the success of Hydrolastic, was suspension system using pressurised nitrogen gas as the springing medium and water as the working fluid. Each side of the car had its suspension units connected front/rear, and damping was provided by the fluid flow through valves. No sliding seals, pumps or electronics were needed. Hydragas was used on a number of British cars, up to in fact the MGF sports car. One of the reasons that Hydragas gave a good ride was the front/rear interconnection. Another was the constancy of damping at different loads, and yet another was the rising spring rate design. However, while all these ideas sound good in theory, how in an engineering paper could the engineers show their system’s improved ride quality? The answer was by measurements. 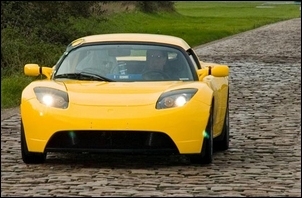 In the paper the authors measure the ride performance of a range of cars, showing how it can be done in a technically accurate and effective manner. In terms of ride comfort, it’s not the distance of movement of the human body that’s so important – it’s how fast the body is accelerated. If you’re sitting on a platform that’s slowly raised 2cm, you barely notice it. But if that same platform is violently accelerated upwards that same 2cm, it’s very uncomfortable indeed! In fact, if the platform is accelerated upwards at 9.8 metres per second per second (1g), your effective weight doubles. Not nice. And it would be equally uncomfortable if the platform suddenly dropped beneath you – if it accelerated downwards at (say) 1.2g, you’d actually get left behind for a moment in the air before you hammered back down on the seat. Again, not nice. So high rates of acceleration, either upwards or downwards, give poor ride comfort. Up/down accelerations, such as those described above, are called accelerations in the ‘Z’ direction. However, these accelerations are not the only ones to worry about. In fact, Z accelerations are often the least important ones! To understand the next type of accelerations, imagine that you’re in a short wheelbase vehicle with no suspension – say, you’re riding an unsuspended bicycle across bumpy ground. To make things worse, the bike has small wheels and the tyres are pumped up hard. The front wheel hits a bump and up it goes, tilting the bike backwards. The front wheel moves on and then the rear wheel hits the same bump, lifting the rear of the bike. This time the bike tilts forward. If you picture the bike travelling across this bumpy ground, and you’re standing to one side watching the rider’s head, you can see that each time the front of the bike moves up or down, and the back moves up and down, the rider’s head accelerates forward or backwards through an arc. This is called pitching. Pitching accelerations are in the ‘Y’ direction. 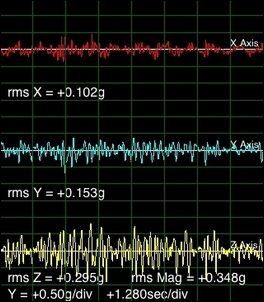 Finally, we have ‘X’ accelerations – accelerations in roll. For example, these occur in a car when the wheels on one side of the car suddenly drop off the edge of bitumen onto a lower dirt verge and the heads of the vehicle occupants whip sideways. In a vehicle travelling over a bumpy surface, the occupants are subjected to vertical accelerations and accelerations in pitch and roll. Usually, these accelerations occur in combination – that is, there is a mix of acceleration directions occurring simultaneously. Minimising vertical accelerations (those in the Z direction) can be achieved by using soft springs and soft bump damping. But the picture gets much more complex when you start to think about pitch (Y accelerations) and roll (X accelerations). Take pitch for example. To minimise pitch what is needed is that the front and rear springs always compress and extend at the same time – that is, the front and rear suspension systems are in phase. But how can that be achieved? One approach is to use softer front springs than rear springs. This means that the natural frequency of the front suspension is lower than the rear. (The natural frequency is the rate at which the suspension naturally bobs up and down.) As this diagram shows, if softer front springing is used, it takes only a few motions of the suspension after a bump has been passed for the front/rear springing movements to be in phase. That is, there is an initial pitch but it very rapidly dies away. Achieving success with this approach is dependent on vehicle speed, wheelbase and the pitch polar moment of inertia (ie the weight distribution influences how susceptible the car is to pitching). Using softer front springs also means that to get adequate roll resistance, a heavier front anti-roll bar is needed (we’ll come to the implications of that in a moment). Another approach to reducing pitch is to interconnect the front and rear suspensions. This has been done on a number of cars, including Packard, Citroen and BMC products with Hydrolastic and Hydragas systems. The Moulton-developed Hydrolastic system is shown here in schematic form. When a front suspension unit is compressed, fluid flows to the rear suspension unit (on the same side of the car) and so extends the rear suspension. The result – less pitch... and unlike using softer front springs, it’s not dependent on car speed or wheelbase. 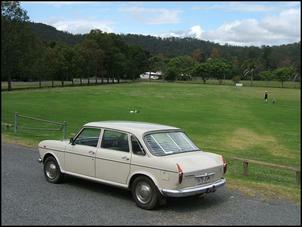 I once owned a 1960s Austin 1800 with the Hydrolastic suspension system. The Austin tended to flow along the road; bumps were met with a ‘heaving’ motion as the front and the rear rose and fell together. So minimising pitch accelerations is a lot harder than it first looks – but what about roll? When considering roll, remember that we’re not talking about how much roll occurs (ie how much the vehicle leans) but how quickly it accelerates in roll. One example of where roll accelerations can be great is in vehicles with stiff anti-roll bars. Think of a vehicle with soft front springs (good for reducing pitch accelerations!) but with a stiff front anti-roll bar to prevent lots of body roll. In two-wheel front bumps, the anti-roll bar just pivots on its bushes without twisting, but for one-wheel bumps, the anti-roll bar resists wheel deflection – to put this another way, the anti-roll bar (working with the spring on the other side of the car) stiffens one-wheel bumps. To picture the effect of this, pretend that the one wheel suspension is very, very stiff - and that wheel then passes over a brick. As the corner of the car is quickly lifted, the car will rapidly accelerate in roll (and will also pitch a bit). I once experienced this characteristic in an expensive luxury car running very soft springs but (presumably) a very stiff rear anti-roll bar. The car rode fine in most conditions but then one rear wheel fell into a pothole. The sideways jerk of my head was so sudden that I actually thought the rear of the car had jumped sideways. Finally, it’s important to know that of the three directions in which accelerations can occur, the human body most dislikes pitching. Following that are roll and vertical accelerations – so the up/down bumps are actually the least important to minimise. Now all of that might be of so much academic interest – but for one thing. In the next part of this series I’ll show how, if you have (or can borrow) an Apple iPhone or iTouch, you can easily and cheaply measure ride quality accelerations and then analyse their meaning. If you’re interested in vehicle design, it’s a fascinating exercise. And if you’re developing a suspension system from scratch, it’s one of the tools you simply must use if you’re after best results.